I took my first photographs with the family Polaroid camera. I can’t tell you what I photographed, and I wasn’t allowed to take many, because the instant film was, to use one my dad’s favorite words, “expensive.” There was no epiphany involved in taking these forgotten and certainly forgettable pictures. But in retrospect, there was something about the instant film process that I’ve spent the rest of my life chasing: control. 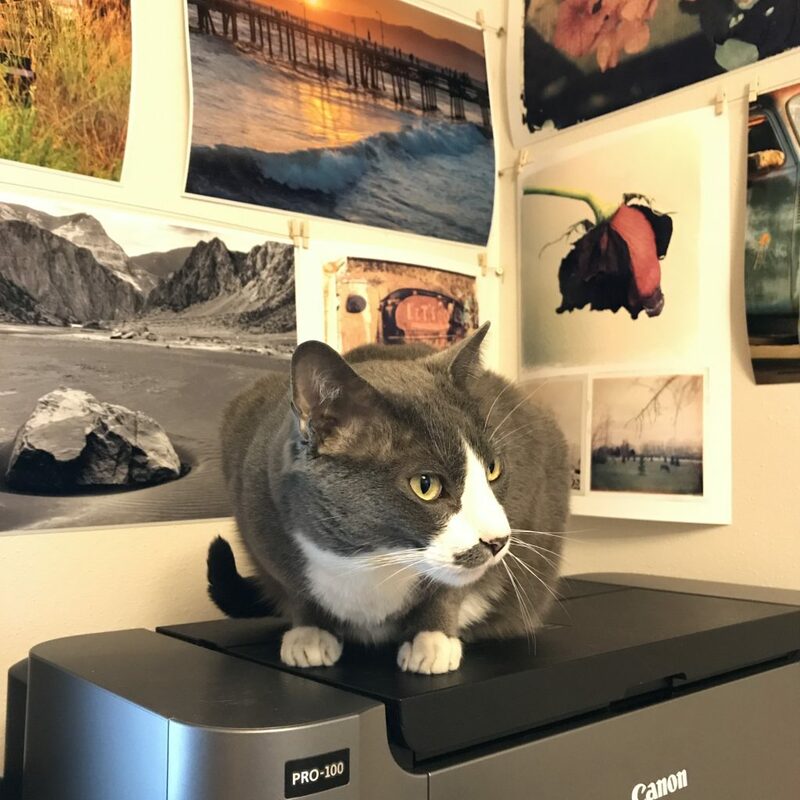 Suede, self-appointed studio cat and “helper” guards the Canon photo printer from all enemies, foreign and domestic. The fact that Polaroid film developed in your hands was magical to me. Even as a kid, I knew it was preferable to dropping film off at the drug store and going back later to pick up the prints, or, as was also common, mailing the film off to a lab and waiting for prints in the mail. My first memory of fighting for photographic control was in third grade, and the fight was against my mother. My first memory of fighting for photographic control was in third grade, and the fight was against my mother. My teacher at Franklin School in Detroit taught a lesson about different kinds of plants, and during the discussion on “ivy” I raised my hand and excitedly shared that a brick building on my block was covered with it. I volunteered to take a picture of it and bring it in the next day, as if no one else who lived in my neighborhood had ever seen such a thing. The teacher (whose name I sadly have forgotten) graciously agreed to my unnecessary task. I had in my mind the photograph I wanted to take: a close-up, shot at an angle, of ivy leaves clinging to the side of a red brick wall, light falling at an angle, showing off the texture of the leaves and the brick. That picture is still in my mind. But that’s as far as it would go. As soon as I got home, I told my mom I needed to borrow the Polaroid to take this great photograph that would enlighten my classmates as to what ivy really was. The teacher’s description and the image in the book we were studying were not enough! They needed my photograph of actual ivy, growing wild right on my block. I was so excited to create and share this work of art. I anticipated the oooohhs and ahhhhs of my classmates and the teacher as they examined my work and wondered how I, at so young an age, could have produced such an incredible photograph. My mom agreed with my plan, or at least I thought she did. But when I asked to use the camera, she said she would go with me and help me. Such disillusionment, at such a tender age. Nooooo! Great artists do not need their mommy to “help” them! I knew how to use the camera, and could do it myself. I begged and pleaded to do it on my own, but she would not relent. This was my first experience with “creative differences.” Such disillusionment, at such a tender age. We walked down the alley to the ivy-covered wall. I eagerly reached out for the camera. “No,” she said, “I’ll take the picture.” What was going on? She obviously did not understand my vision… my passion! But she was the mom. “Well, maybe we’ll do that one in a minute, but let me do a different one first.” She directed me to stand in front of the wall. I argued, and may have even cried. She just didn’t get it at all! How could I explain that she was thwarting my artistic vision, my standing among my peers, and perhaps even my lifetime career goals? 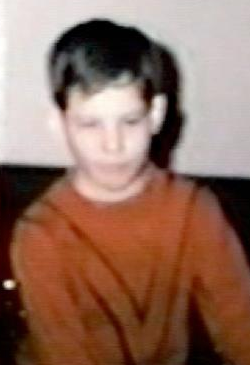 The ivy photograph is lost to time, but here’s me at about the same age, taken from a grainy home movie. Well, I couldn’t. I stood there, slack-armed in my brother’s burgundy hand-me-down long sleeved shirt, still several sizes too big for me, and faked a smile so we could get this picture over with and I could take my stunning photograph. Anyone reading this who is a parent, or has ever had a parent, knows that when a parent says “maybe in a minute” they are just saying “no” while trying to delay the argument. Such was the case here. I didn’t get to take my ivy picture. She said her shot used the last of the Polaroid film. I don’t know if that was true or not, but I knew I wouldn’t get to take my picture. This was tragic at the time, but I know my mom only meant well. She couldn’t understand the value of “wasting” a picture that didn’t show a family member. I took the photograph to school the next day. It showed a skinny, short-haired kid against a wall of ivy, shot straight-on. He was low in the frame, and the baggy sleeves of his burgundy shirt fell nearly to his fingertips. He was smiling awkwardly. With the teacher’s permission, I showed the photograph around to each classmate, one by one. And each time, I pointed helpfully to the clinging leaves and said, “This is the ivy.” A decidedly anti-climactic end to my plans. No exclamations about my artistic and photographic brilliance. Just an occasional “oh” or “hm” from my polite but rightfully disinterested classmates. I got serious about photographer as a teenager, when I took a photography course as part of my Graphic Technology curriculum at Detroit’s Cass Technical High School taught by Mr. Willard. He also taught letterpress printing, offset printing, page layout, and basically every course required for that field of study. Every step, from firing the shutter on the camera, to developing the film, to making the enlargement, was in my hands. This was 1976 and digital photography wasn’t even a thought. We shot black and white film so we could develop it and make our own enlargements in the classroom’s well-stocked darkroom. There were several enlargers, numerous film developing tanks, and two wide, flat, steel sinks. Three trays floated in several inches water in one sink: developer, stop bath, and fixer for producing enlargements. A sheet of glass leaned in the second sink for rinsing the finished prints before carefully squeegeeing the excess water and hanging them on the line to dry. I loved having this kind of control. Every step, from firing the shutter on the camera, to developing the film, to making the enlargement, was in my hands. Over the years, I’ve developed and enlarged my own prints in makeshift black and white darkrooms in houses I’ve lived in. I’ve also sent a lot of film to labs, where I had to trust others to create the final prints. I’ve continued to shoot instant film and make Polaroid transfer images, many of which are on this site. But the advent of digital photography, along with high quality photographic printers has finally put total control back into my hands. I can now do every step myself. I shoot with instant film, as well as digital images, and sometimes combine the two into one image. I output my final prints right in my own small studio/office using archival inks and paper that will last a lifetime. I can tweak each image until it’s exactly to my specifications. Technology has given me an incredible level of control over my work. It’s so much easier to shoot, edit, and print my images. But there’s one thing that technology hasn’t helped me with, and is still the most difficult part for me: figuring out what to shoot next.